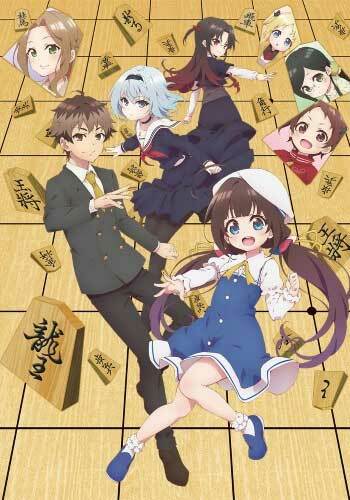 Yaichi Kuzuryuu finished middle school and made a big decision, he became a professional shogi player. Now, at the age of 16, he has become the youngest champion, also known as Ryuuou. One day, he returned home, just to find a young girl, named Ai Hinatsuru, asking him to become her shogi instructor. Yaichi is surprised by her and decides to decline after they play a game. However, he is astonished to see a young player with such skills and knowledge from such an ancient game. Even more, Ai has been playing only three months, after she witnessed Yaichi’s play. Yaichi feels motivated, and considers to become her instructor. However, before that happens, she has to prove herself. They spend the whole night playing, and the next morning, Yaichi receives the visit of Ginko Sora, another shogi professional, who gets enraged seeing him with such a young girl at home. Later, they all visit Kousuke Kiyotaki, Yaichi and Ginko’s instructor. He has received information that a young girl has escaped her home and pursues to become a shogi player. After seeing her determination, she is accepted to become a temporary disciple during the spring break. Ai begins to train, and she takes no time to make new friends. However, before she can prove her teacher she can become a professional, her parents show up, claiming to be concern over the stability of such life. When her daughter fails to satisfy her requirements her mother attempts to take her back home, however, Yaichi decides to step up, and even accepts an odd condition from her mother, if she cannot become a professional shogi player in the next years, he will have to marry her and join the family business. A light novel series written by Shirow Shiratori and illustrated by Shirabi. A manga adaptation with art by Kogetaokoge has been serialized in Square Enix’s magazine Young Gangan since 2015. An anime adaptation by Project No.9 began on January 8, 2018.